Home Antique of the Week	Hollywood Regency Crystal Wall Sconce! 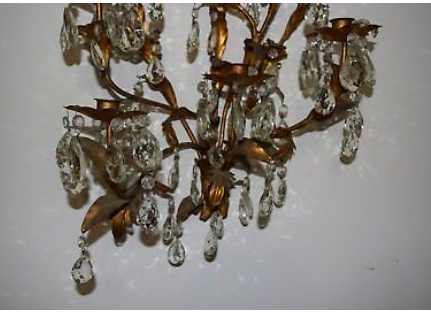 Hollywood Regency Crystal Wall Sconce! Greetings and Happy Wednesday! Today I want to share a little bit of sparkly delight I recently purchased for our new house. Is it a crystal chandelier? That would be an excellent guess, however, it’s a Hollywood Regency crystal wall sconce! Want to see? If you know me, you know how I adore a vintage crystal chandelier. Well, a crystal wall sconce comes in a close second! This is my favorite electrified wall sconce. It hung in our former dining room. I put small, flickering 7 watt bulbs in it to simulate a flame. It is carefully packed away awaiting it’s new spot in the new house. And the beauty of a plug-in sconce is it can go anywhere you have electricity! By the way, if you are searching for something similar on eBay be sure to use “Hollywood Regency” or “Italian” in your search. It helps! Gold leaf and antique crystals do it for me every single time! How about you? Therefore, when I spotted this beauty on eBay for a buy it now price of $75 I snatched it up! I think you’ll agree I couldn’t pass it up. It quite possibly could have belonged to Liberace. This sconce holds 6 candles and because of it’s asymmetrical shape, it leads me to believe it was once one of a pair. The OCD side of me is a little concerned about the lack of symmetry, but the crystals and gold leafing will help me get over it. And for once, the sconce arrived with all of the crystals firmly attached. Not one of the crystals fell off amidst the 10,500 packing peanuts in which the fixture arrived. Honestly, I hate packing peanuts. Even the pink ones. I had this shipped to my parent’s house so it was one less thing for me to haul down South in our moving truck. My Mother and Dad were always so great to let me ship things to their house. It gave me peace of mind to know something arrived safely, especially when we lived out of town. No longer necessary! We live in the same vicinity now! Right now I have no idea where this antique beauty will hang. I’ll know more once we move into the house on FRIDAY. The long awaited move is happening in two short days! Meanwhile, we’ve sold our kitchen table and chairs at Happy Hill and will replace it with one from our last house. A massive musical furniture game is about to commence.